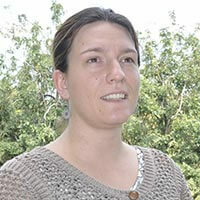 Laurence Jassogne is the Project Coordinator – Systems Agronomist. She is based at IITA-Uganda. Laurence is a Belgium citizen. She has Ph.D. in natural and agricultural sciences from the University of Perth, Western Australia in 2009. She obtained a M.Sc. with major in Soil Conservation and minor in tropical and sub-tropical agriculture from Catholic University of Leuven, Belgium between 1998 and 2003. Prior to her appointment, she was a Consultant at IITA – Uganda from 2011 to 2013. She was a Postdoctoral Fellow at the Catholic University of Louvain-la-Neuve, Belgium from 2009 to 2011.